Mustafa Misirci, owner of Angelico La Pizzeria, attended a conference of small business owners. One of the speakers mentioned that a store should be "refreshed" every three years to stimulate the interest of the customer... That's where I came in! I had just finished up the Max's Best Ice Cream project and I was eager to share the images with ANYONE willing to look. It was just then that I received a call from Mustafa saying it was time to spruce up the place. 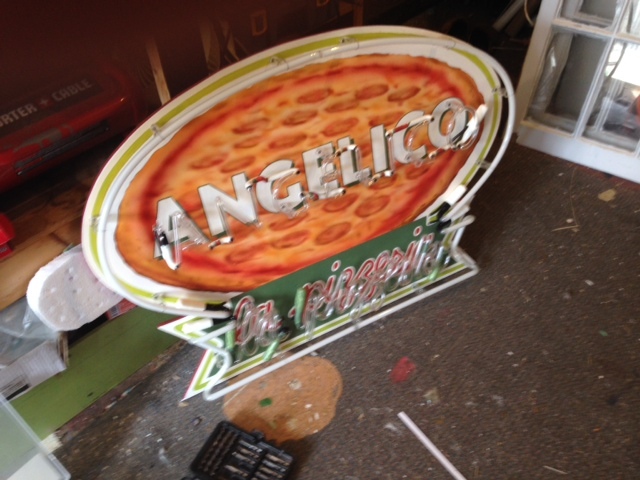 Angelico La Pizzeria is a returning customer so I had to give it my all. After transposing the logo to paper, I travelled out to see my neon guy, Bill Miller, to get his feedback. He thought the pattern was fine but explained that, for him, it needed to all be backwards! Turns out they create these things with all the letters flat - returns, etc need to be behind the visible neon. Love to learn new stuff. Bill is truly a craftsman and was eager to show me the beautiful pizzeria he created. If you ever get a chance to see these folks at work definitely do it and remember, like many things in this life, IT'S WAY MORE DIFFICULT than it looks. I left Bill to his work as I had things to do myself. So, back to the board. Start with cutting it out. 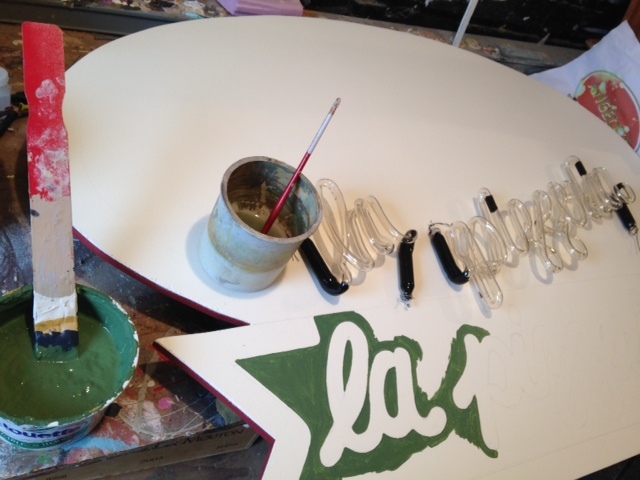 The shape had to be just right to accommodate the neon being created. Too small or too big and I'd need to do it again. I took my time remembering a saying I love - WHY IS THERE NEVER ENOUGH TIME TO DO IT RIGHT THE FIRST TIME BUT ALWAYS ENOUGH TIME TO DO IT AGAIN? Cut and primed it was time to start the fun part (actually, all of it is fun - If you have a job that you love, you never WORK a day in your life!) by painting in the details. I began with "la pizzeria" and after some hours I found my efforts good. Then a call from Bill, "Neon is ready!" For the pizza pie oval I decided that to simplify the design and stay away from a cluttered look I would stick with a pepperoni 'za. After a little sketching it was time to pull out the trusty airbrush! This proved to be the right way to go as it softened the image and did not detract from the text. I snapped a photo, texted it to Mustafa, and received a thumbs up! Whew! I really liked the look and definitely did NOT want to cover it all up with a solid RED. After carefully installing the neon (another fun part I'll have you know) it was time to try it out. It's like a Dr. Frankenstein moment - IT'S ALIVE! IT'S ALIVE! Along with a helping hand from Mustafa I installed the piece and the smile on his face could not be wiped away - he said it was beautiful. For me, making others dreams come true is just about the best thing in the world. I wrapped the glass with printed vinyl promoting his fare and called it a day. So, looking back to that conference he attended, he did as was suggested and we "spruced up" the facade of Angelico La Pizzeria in Tenleytown, Washington, D.C.. By the way, the pizza is DELICIOUS there. The signs may draw you in but the food will keep you coming back! Newer PostGriffith Stadium Comes Back to DC!